Last night was Social Media Night at Chase Field. Fans interested in participating could purchase a package for about $30. It included a lower level ticket, early entry into the stadium for batting practice, an @Dbacks T-Shirt and $10 in D-Bucks to spend in the Team Shop. The main event was a Q&A session with Diamondbacks broadcasters Greg Schulte and Steve Berthiaume as well as my favorite player Daniel Hudson. After the panel, Daniel signed autographs and took pictures with everyone who waited. Daniel signed my 2012 Bowman International card and I got a pic too. The whole thing was pretty cool. I brought home some great stuff and there's still even a chance I'll win something in their Instagram contest. 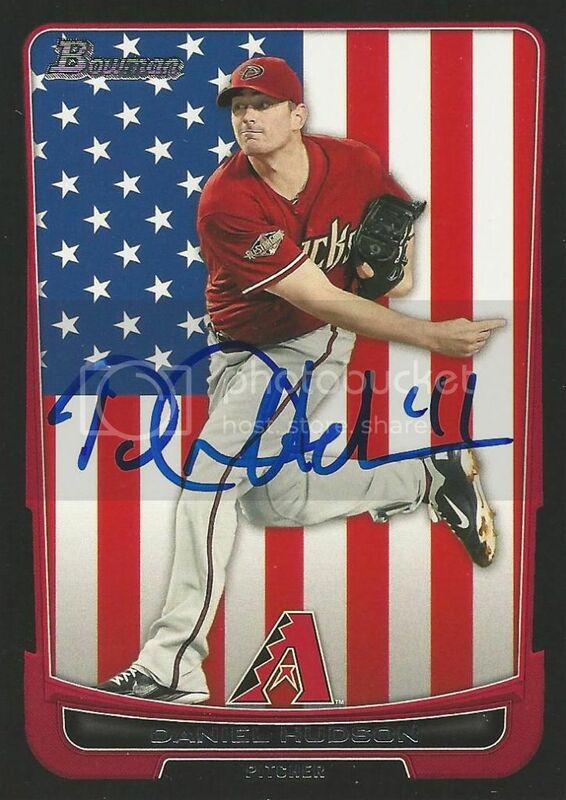 That's a nice card to get autographed.